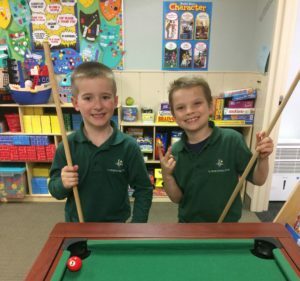 St. Peter Catholic School’s Extended Day program offers flexible, dependable and nurturing before and after school childcare for students in grades K-8. Children participate in arts and crafts projects, socializing, games, reading, and homework, as well as recreation and enrichment activities. In addition to individual playtime, our staff organizes group activities to cultivate cooperation. Each week, students participate in relay races, bingo, and craft projects. The program provides individual attention, and opportunities to form friendships in a safe and nurturing atmosphere. A nutritious breakfast and afternoon snack are provided for children. Registration requires a fee of $55.00 per family per year. Parents and guardians must also complete and return a registration form for each child attending Extended Day. Registration forms can be obtained by contacting our coordinator, stopping in during Extended Day hours, or downloading the form from our website. Scheduled Care: Care that is consistent on a weekly basis and occurs more than once weekly. The cost of this care is $12.00 per Scheduled Day. Care that only occurs one session per week or occasionally. The cost of such care is $14.00 per day. *****A Special Discount of $2.00 per day will be given on days in which you attend both AM & PM Sessions more than one time a week. ***Please contact the coordinator if you require care that has early dismissal due to an activity Late Pick-Up: Failure to pick-up child by 6:00pm will result in a late fee of $1.00 per minute. For more information, please call 651-777-3091 ext. 6158. Extended Day offers two sessions each day: one in the morning and one in the evening. Our morning sessions begin at 6:30 am and includes breakfast. Students are dismissed from Extended Day at 9:05 am and then head upstairs to their classrooms to begin the school day. In the afternoon, our staff picks-up the students from their classrooms and provides them with an afternoon snack. Students may stay with Extended Day until 6:00 pm in the evening. We also offer all-day care on workshop days. Our full day hours begin at 6:30 am and conclude at 6:00 pm. Students are provided with breakfast, morning snack, and an afternoon snack, and are asked to bring a bag lunch. We provide a variety of planned activities such as craft projects, story telling, and outdoor games in order to keep the children engaged and active throughout the day.